It’s snowing outside. The NS has changed the train schedules because they just can’t deal with the tiniest amount of snow and ice. Therefore, I’m staying in tonight instead of going to Amsterdam to knit with my knitting buds. DB sat down on the couch, flipped open his laptop and proceeded to play the Kennedy Honors Tribute to Led Zeppelin that was originally aired on December 26, 2012. This was definitely better than going out into the cold. If you are any kind of rock music fan you really should watch this. Led Zep, as Jack Black states, is the best rock ‘n roll band ever. Every rock band since owes them a debt for their genius that lead the way. During this tribute, others came on stage and performed Led Zeppelin songs, which only showed how incredible the band was. No one can match that sound, that power, that hit you in your gut music. During the last song (I won’t tell you what it was – you go watch it) Robert Plant got tears in his eyes and had to wipe them away. It was really touching. A short, but sweet, event. If you watch the video you’ll see why I pulled out this photo and posted it here. 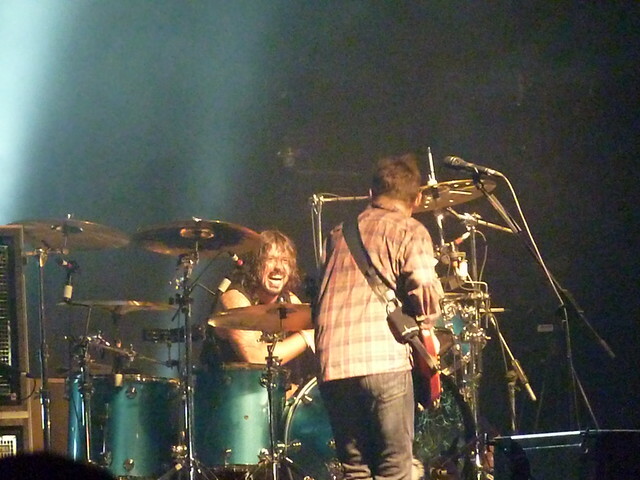 It’s one I took at Pukkelpop in 2009 of Them Crooked Vultures featuring Dave Grohl on drums and John Paul Jones on guitar. Dave Grohl is an animal on drums. I don’t think he should ever do anything else. This photo was actually stolen by a music e-mag and no matter that I asked them to take it down, it’s still on their site. Ah well. The last time we listened to Led Zep was on Christmas morning. I bought DB “Celebration Day” for Christmas. When was the last time you listened to Led Zep? Go on, do it now.